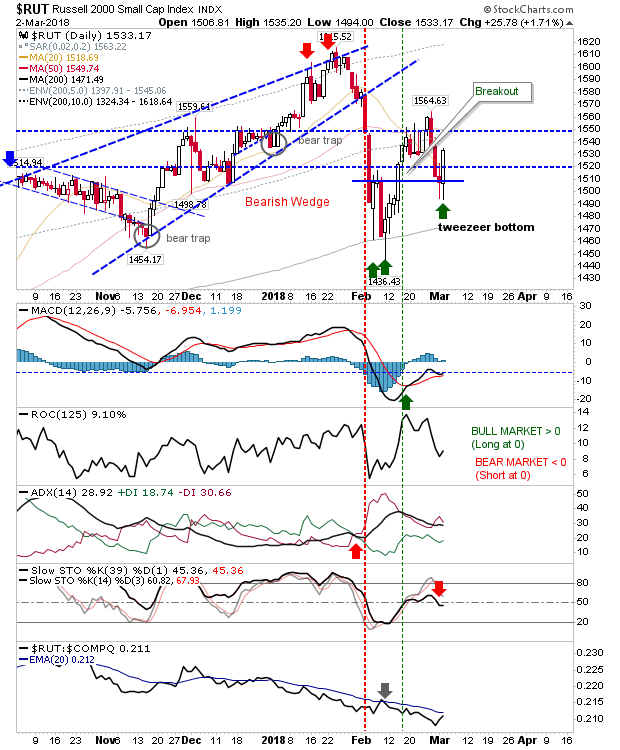 Swing Low in Russell 2000? It was a strong finish for markets as they clawed back some of the early week losses. Some indices do look better than others and could offer bulls the opportunity they need into next week. Best of these could be the Russell 2000. The index left a picture perfect 'tweezer bottom' which has the potential to morph into a swing low. If true then the index should push beyond 1,564 with little difficulty before challenging 1,615; risk is measured against a loss of 1,495. 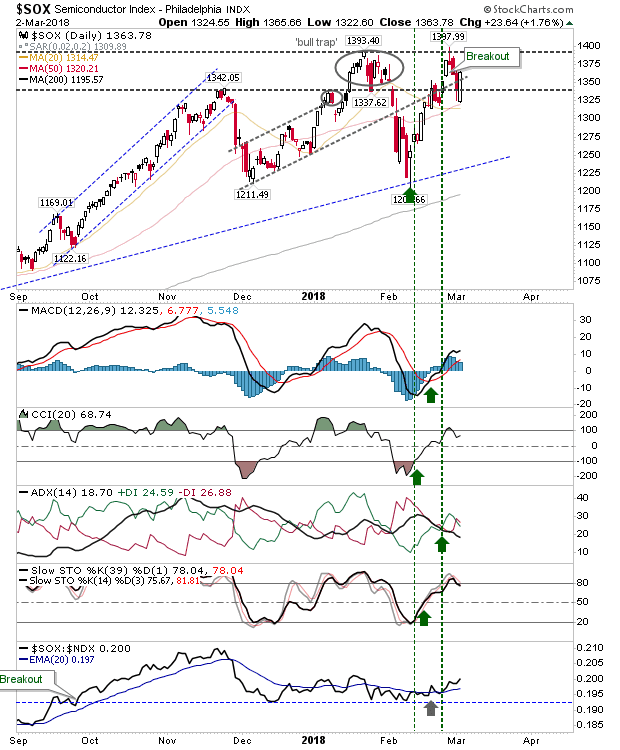 The Semiconductor Index is another index setting up for a bullish move. 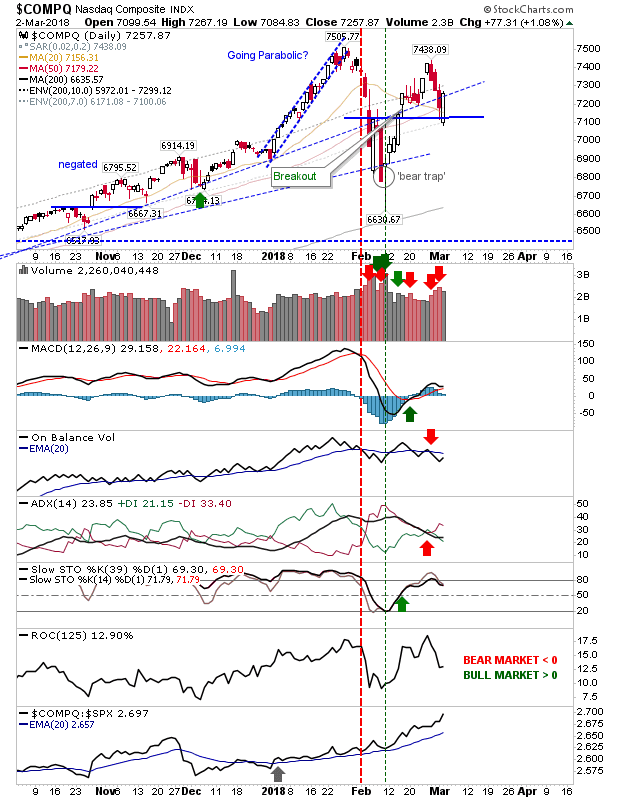 The index is close to negating the 1,393 'bull trap' and become the first index to reach 'all-time' highs for 2018; look to this strength to filter down to the Nasdaq and Nasdaq 100. 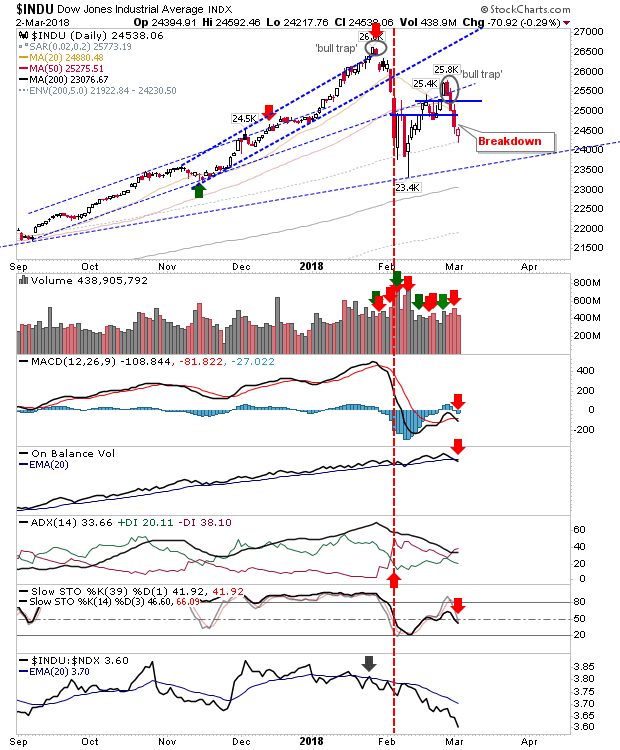 The Nasdaq 100 has already successfully defended breakout support from February (which coincidentally was also former channel support for the last 6 months). Given the proximity to major resistance, it may take a little longer to actually break to new all-time highs but a loss of 6,645 should be a good place for stops. 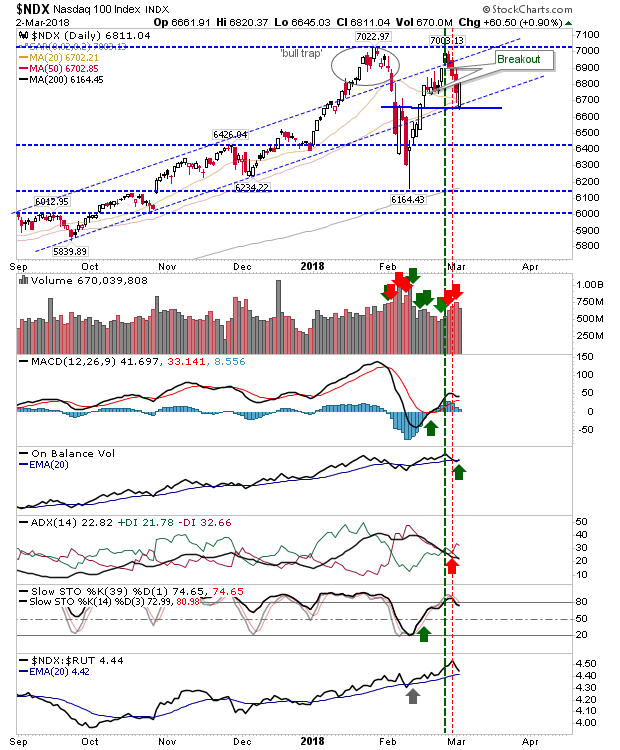 The Nasdaq is not as bullish as the Nasdaq 100 but measuring upside risk from a loss of 7,085 should be good for the coming week (i.e. buy into weakness towards 7,085). Relative performance continues to do well as it posted new 6-month highs against Large Caps. And the only disappointments were from Large Caps. The Dow Jones barely finished higher and finished the week in breakdown territory. While the S&P struggled to make it back to the 'bull trap' resistance/support level. It probably did enough to suggest it can challenge the 'bull trap' but it will struggle to negate it. Note the rapid shift in relative performance - this is not an index ready for a leadership role. Luckily, as long as the Russell 2000 can lead it will only be a matter of time before money cycles back into Large Cap stocks. For Monday, look for Semiconductors and Russell 2000 to lead. 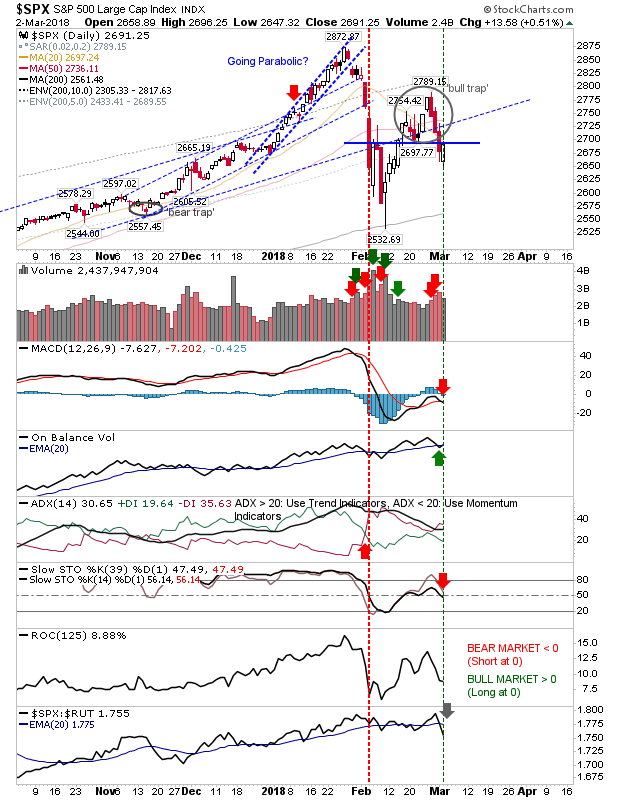 Should these struggle to follow through in early morning trading then search for potential shorting opportunities in the S&P and Dow Jones Industrial Average.